Ladies night Dubai offers have certainly evolved over the years. With specials to be found throughout the week (it’s not just Tuesdays anymore! ), here are a few Dubai ladies night offers to try this month. Check them out! Vibes: This cocktail bar and lounge is all about showcasing the best of Mexico and Latin America. Wait until you to see the awesome ceiling decorated with hundreds of bottles! Offer: Every Tuesday, Blind Dragon is offering ladies 3 complimentary beverages alongside 50% off the food menu. Vibes: This Chinese-inspired lounge knows how to have a good time. Want to take things up a notch? Book one of their private karaoke suites for you and your girls. Offer: Every Wednesday from 5pm until 11pm, ‘Lady’s Boy Night’ at Mr Miyagi’s gets you three selected food dishes, along with 2 hours of unlimited drinks for AED 99. 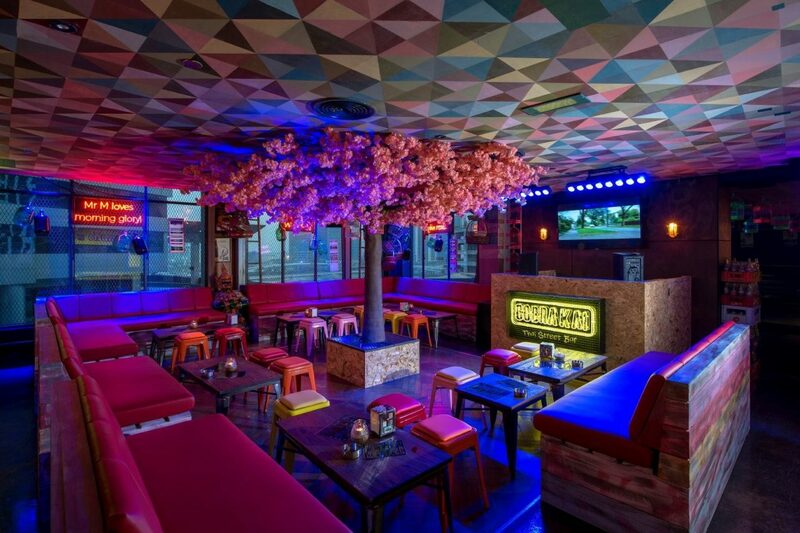 Vibes: This Asian restaurant-bar is definitely quirky, serving up street food specialties in a space decorated with funny puns and colourful decor. Offer: Every Tuesday from 6pm until 10pm, Gursha serves up free selected beverages for its ladies night Dubai special, including 30% off the a la caret menu. Vibes: One of the few Ethiopian restaurants in the city, soak up the views from the Palm while sampling some incredible cuisine. Eat with your hands – it’s encouraged! Offer: Every Wednesday from 6pm until late, Boa hosts their signature ‘High Heels’ night with a complimentary bar for the ladies. Vibes: This is a party destination, so don’t be afraid to get dolled up for a Dubai ladies night on the dance floor.